We were plunged into physical darkness at Junya Watanabe, but from the dark emerged a headful of feathers, a flutter of floral lace and a wistful romantic mood prevailed at Junya Watanabe. Watanabe has dealt with floral fancies before but this time round it was imbued with a deeply felt sensibility where you were thinking these blooms and feathers were a guise of optimism, a facade that hid something sad. Perhaps that was the lighting. Physically speaking, it was a show of craft that concentrated on floral lace embroidered with reds, blues, purples and based in black that reminded one of Spanish shawls or tablecloths. 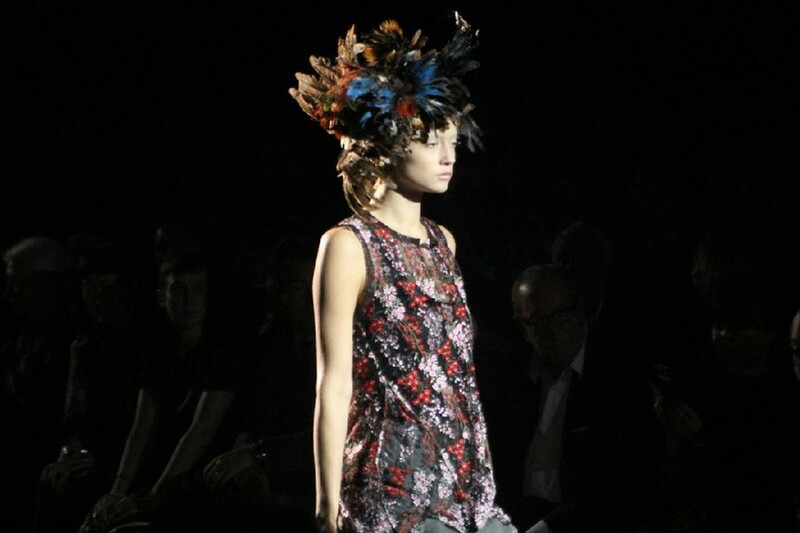 Every model was topped off with a head of artfully arranged feathers. Were they birds or were they simply interpretations of headdresses he had picked up on his travels to a Hispanic country which is what a lot of the collection vibed out. Punk didn't fly out of these feathered heads though as the biker jacket came cropped and adorned with flameco-dress ruffles at the shoulders. Volume was created elsewhere with tufts of tulle and asymmetric ruffled skirts placed at will where Watanabe saw fit. In any Junya Watanabe (or indeed the whole Comme universe) collection, it's difficult to just look at the clothes at face value which makes the fact that they say very little about what they do all the more intriguing. You watched the show wondering where this woman was from and why did she come bearing feathers and flowers. Going back to women taking flight, it became a whole lot clearer when his series of trenches and capes came billowing out with some trailing at the back. It's canny that Watanabe has imbued such a powerful metaphor in what will certainly be the pieces that fly off the racks.